Admiral Thad W. Allen assumed the duties of the 23rd Commandant of the U.S. Coast Guard on May 25th, 2006 retiring from the service on June 30, 2010 while continuing to serve as the National Incident commander of the BP oil spill disaster until after the wellhead was permanently sealed. Admiral Allen is a native of Tucson, Arizona and graduated from the U.S. Coast Guard Academy in 1971. He served as the Coast Guard Chief of Staff and Commanding Officer, Coast Guard Headquarters, in Washington, D.C., from May 2002 to April 2006. 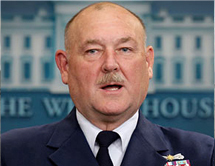 In September 2005, Admiral Allen was designated the Principal Federal Official for Hurricane Katrina response and later for Hurricane Rita, for which he was universally praised. Prior to his assignment as Chief of Staff, he served as Commander, Coast Guard Atlantic Area and led the Coast Guard’s Atlantic Area forces in response to the terrorist attacks of September 11, 2001. As Commandant of the Coast Guard during the administration of George W. Bush he was instrumental in bringing attention and advocating for a strong U.S. Arctic policy in response to loss of sea ice linked to climate change. When President Obama established a taskforce on U.S. Ocean Policy in June 2009 Admiral Allen also played a vital role that led to a Presidential Executive Order promoting a new approach to America’s public seas in July 2010. Admiral Allen holds a Master of Public Administration degree from the George Washington University and received the Alumni Achievement Award in 2006. He also holds a Master of Science degree from the Sloan School of Management at MIT. In 2003, Admiral Allen was elected a National Academy of Public Administration Fellow. He is now a Senior Fellow at the RAND Corporation.